, Government and Credit Account Holder's Purchase Orders are welcome. Holds 1 x canister/tub of clinical/industrial wipes. Max diameter 110mm (hole size: 112mm). Manufactured in Heavy Duty, Easy Clean, Bright White Rigid PVC which is extremely hygienic unlike wire types that are difficult to clean and can harbour dirt and grime. 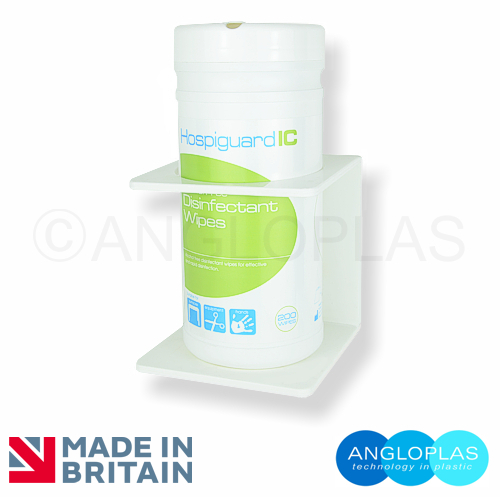 Keeps work surfaces clear and provides quick and convenient access to wipes. Long life, no maintenance required. Suitable for Hospitals, Care Homes, Schools, Dental Surgeries, Veterinary Surgeries, Kitchens and Food preparation Areas, Manufacturing areas, etc. Supplied complete with wall fixing kit. *Prices EXCLUDE postage, packing & VAT. These will be applied during the checkout process. To check the applicable postage & packing costs please click DELIVERY on the main menu above or click this link to open the Postage & Packing Costs page in a new window. Please note: If dispensers are shown complete with consumables this is for display purposes only & are NOT INCLUDED.